Miss Dior Cherie is becoming Miss Dior! It’s hard to believe that Miss Dior Cherie was only launched in 2005 – in that short time it has secured its status as a fragrance classic, and is currently the world’s 5th bestselling fragrance. The scent was reformulated this year courtesy of perfumer Francois Demanchy’s more subtle and sophisticated vision. The look of the Miss Dior Cherie girl has changed a lot in that time, too; from the blonde party girl to the refined Natalie Portman, the scent and its face has evolved with the spirit of the times. With a slight formulation change and a whole new look comes a new name: ‘Miss Dior Cherie’ is becoming simply ‘Miss Dior’, the essence of the young Dior woman (same perfume, just without the word ‘Cherie). The historic ‘Miss Dior’ fragrance from 1947 will change to ‘Miss Dior Originale’, a timeless expression of signature Dior style. The previous packaging will phase out gradually to make way for this new look, so you’ll be seeing the changes soon! You may see some products have already dropped ‘Cherie’ and some haven’t (a little confusing I must admit). So please be reassured that if you order Dior from Escentual – and it does or doesn’t have ‘Cherie’ on the packaging – it’s still the same authentic product, direct from Dior. And hopefully by early 2012, all the new packaging will be in circulation and it will be a little less confusing. As we get the new stock we’ll update the imagery and names on our website accordingly. Below is a very quick run through just in case you’re still confused! As a quick trick – if it’s pink-ish, it’s the former Miss Dior Cherie. If it’s yellowish – it’s the original Miss Dior (the really old one). 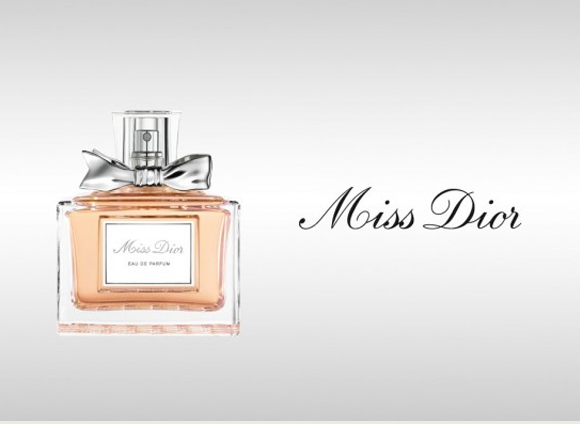 Take a look at our entire Miss Dior Cherie/Miss Dior/Miss Dior Originale selection here at Escentual.com. This entry was posted on Tuesday, December 6th, 2011 at 2:00 pm and is filed under Fragrance. You can follow any responses to this entry through the RSS 2.0 feed. You can skip to the end and leave a response. Pinging is currently not allowed. My mother-in-law has worn Miss Dior for as long as I’ve known. Prior to meeting her I too wore Miss Dior and many other Dior products. I have been buying Miss Dior for her for over ten years and can almost guarantee that she will be delighted. I say ‘almost’ because Christmas 2011 was the exception. Dior in their wisdom has decided that they would keep the name of ‘Miss Dior’ but put a total different fragrance in the bottle. What a very clever way to get rid of a product (‘Cherie’ I’m led to believe) that isn’t proving as popular as the original Miss Dior. The ‘Cherie’ fragrance does not compare in any way to the original Miss Dior. It is not a fragrance I would ever choose to purchase although despite moving on to other fragrances myself the original Miss Dior would always appeal to me as a daytime option. The new box clearly states Miss Dior on it and cleverly makes no mention to it being a ‘new’ fragrance. On purchasing it I was not given an option of the old or new Miss Dior although I have since been informed that the original Miss Dior is now called ‘Miss Dior originale’ As far as I was concerned what I had purchased was the original Miss Dior. Needless to say my mother-in-law opened the Miss Dior box and on smelling the perfume was so disappointed. It ruined her Christmas present that she was looking forward to wearing. An excellent PR stunt. Well done Dior! On trying to exchange the perfume I was told that they had sold me ‘what had been asked for’ and because the perfume had been opened it couldn’t be re sold on so an exchange could not be done. I am furious with Dior and will make sure I never purchase any of there products again. I’m sure I won’t be alone with this one. I have just been given a birthday present of “Miss Dior”, which my poor sister and parents combined together to buy, and on smelling it thought “Either my sense of smell has changed, they’ve been sold a fake bottle, or Dior have changed the scent and are still calling it Miss Dior” Just like Miss Never Again above’s Grannie, I was SO disappointed in the smell, (but I knew that I had to pretend to like it, as it had cost them SO much!) I have only ever worn the “original” Miss Dior, as I can”t stand other perfume smells, and have never been able to afford to buy it for myself, so only have it if it’s given to me as a present; and now I’ve got this great big bottle full of some crap which should have been called Cherie, which I can’t use as it makes me feel sick, nor can I return it to the shop, or give it to anyone as it’s already opened. So annoying. so just to be clear, ‘miss dior’, which should be circulating now that it’s 2012, is the same exact fragrance as ‘miss dior cherie’ (the 2011 version) and that the only difference is the name change? they have not changed the notes or the formula from the 2011 version whatsoever? please let me know! thank you! We’re still in a rather confusing time – as there are still bottles around called Miss Dior and some called Miss Dior Cherie. But to make it easy – if the juice is pinkish – it’s exactly the same as the 2011 Miss Dior Cherie – no formulation change, just a name change. If the juice is yellow-ish it’s Miss Dior Original (2012) which was known as just ‘Miss Dior’ in 2011 – no formulation change, just a name change. If you want Miss Dior Cherie, just check the colour of the juice and go for the pinkish one, and ask an assistant if your’re still not sure. I have been a Miss Dior Cherie user for the past 3 years and love it. Just this morning I had to go to Debenhams to return a bottle of Coco Chanel Madamoiselle (christmas pressie) because still have nearly a full bottle. Having run out of my Miss Dior Cherie I decided to exchange it for this but I couldn’t find it anywhere so asked the assistant. She replied by telling me that Dior have dropped the ‘Cherie’ and it’s now just Miss Dior. I trusted her and purchased a 30ml eau de parfum at £46. I got it home and immediately decided to have a spray. The top note did smell like ‘Cherie’ but after having it on for 1/2 an hour or so I can definitely say it’s NOT the same as ‘Cherie’, the bottom note is far more musky and not my taste at all. I now there’s not much I can do about it so will have to keep it. It’s okay but no where near as nice as ‘Cherie’. I have read up on it and they have tweaked it a little apparently. Not Good! Absolutely Blooming, new on Dior’s counter, may please those of you who loved Miss Dior Cherie.So glad I found it !!! Try it you’ll be pleasantly surprised…I was!. This is utter BS I can’t believe Dior pulled this s*** and then stuck a nobody like Nathalie Hershlag (yes that’s her real surname) on the pr drive. The ONLY reason they changed the scent was to keep in line with new EU cosmetic directives. Dior used to be the fashion house that stuck 2 fingers up at authority and the establishment when they didn’t agree to what they were being told to do. Now they bow down to the slightest bit of pressure. If john galliano hadn’t been sacked he would have fought tooth and nail to preserve the legend of the ’47 Miss Dior and the ’05 Miss Dior cherie. Dior have lost their balls, what they’ve done is sacrilege. Dior cherie was my signature scent since its ’05 release. You have stolen a part of my identity Dior, how dare you. Go plank in hell. I totally agree. Yes, I feel like I have lost my identity too! Will Dior come to its senses? What the hell is going on!!! I am devastated. I would rather wear no perfume than wear anything other than the real Miss Dior Cherie. What is worse is that they try and say the new sickening Miss Dior EDP perfume is Miss Dior Cherie EDP! We have just purchased something we were assured was Miss Dior Cherie – we even handed the sample card over having loved the sample and we bought a large bottle. Having opened it and tried it we were confused by the difference in smell and after searching the internet it became clear what has happened. The liquid is yellowish and is the old Miss Dior, but is old stock. It cost a fortune only to get the wrong one – and how were we to know without opening it? The perfume shop in the Eden Centre in High Wycombe sold it to us as the one we asked for so they are obviously in the dark as well. Two deeply unhappy customers here. Oh good GRIEF!!!!!!! I have decided to buy the PROPER Miss Dior and am very glad that I read this forum, as it has been several years since I last purchased this classic (and classy) perfume. Why is there this compulsion on perfumiers to dumb down perfectly wonderful (and sucessful) signature perfumes? They are all at it. Why? Whatever you do to tweak a perfume for the so called modern market (I just think that they can not handle the sent of a real perfume), then it should then be called something entirely DIFFERENT you idiots!! !